The Istituto Svizzero in Milan is pleased to present “Out to Lunch”, a two-person exhibition by Swiss based artists Emanuel Rossetti (Basel) and Kim Seob Boninsegni (Geneva). “Out to Lunch” is the first collaboration between the artists and brings together new bodies of work to a place where time and space are distorted, seemingly woven within one another. 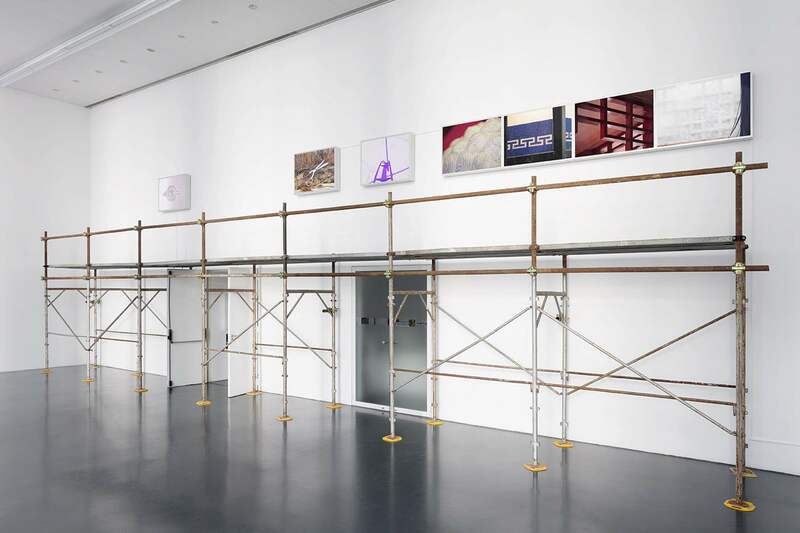 In the main room scaffolding activates attention and disturbs the viewer’s perception. Ten lightboxes present the works by both artists. Boninsegni’s works play on his identity with glimpses of details in Asian restaurants. Rossetti digitally renders mere objects into photographs of a surreal landscape. In the second room a sound installation by Boninsegni pervades the space. The artist temporarily ‘squats’ the room; the installation will then provide the space for his new work Casa Pagoda, an abstract science- fiction film which will premiere on the 11th of October. “Out to Lunch” conjures an image of slow movement. It offers a metaphor for the suspension of time and plays with ideas of proximity. The central scaffolding structure functions to extend time, upholding it, inviting you to rethink its very definition; the neons, instead, renovate the eternal question of ‘The Chicken or the Egg’. With the support of: Kanton Basel-Stadt, Abteilung Kultur; Ernst und Olga Gubler-Hablützel Stiftung; Stiftung Anne-Marie Schindler; Karma International, Zurich. Kim Seob Boninsegni (b. Seoul 1974) lives and works in Geneva. The artist uses a wide range of mediums, from video to drawing, writing, performance or installation. Boninsegni has been part of numerous solo and group exhibitions both in Switzerland and worldwide. His performances have been shown in institutions such as the Théâtre de l’Usine, Geneva (2011). His recent feature film Occupy the Pool (2015) has been screened at various European festivals. Emanuel Rossetti (b. Basel 1987) lives and works in Basel. Recent significant solo shows include: Svetlana Gallery, New York (2017), Karma International, Zurich (2016), Karma International, Los Angeles (2015), and the Modern Institute of Glasgow (2014). Rossetti has exhibited in numerous Institutional shows all over the world; the most significant one was his solo show at Kunsthalle Bern, Delay Dust.